Google made quite a few announcements at Google I/O recently including news of Android L and the new Material design. Android L preview images are now available for some Nexus devices and some very clever coders have been taking it apart to see what is inside. As a result, XDA member “asdfzz” posted an Android L Keyboard apk for non root devices, but to install it you needed to “side-load” the app (i.e. it wasn’t in Google Play), and you also had to uninstall the Google Keyboard if you had downloaded it from the Play Store. This also meant that the Android L keyboard app wouldn’t work on some stock Nexus devices as Google Keyboard is a system app and can’t be uninstalled. But if that all sounds too messy, then fear not, the Android L Keyboard is now available in Google Play. The app installs just like any other third-party keyboard app – no root required, no side-loading and no need to remove Google Keyboard. Installing the app is quite simple. Once you have downloaded it from Google Play you just need to go through the standard three steps to enable the keyboard, switch the input method to the new keyboard, and configure any additional languages, if necessary. Technically Android L Keyboard is just Google Keyboard 3.1.20006 with the Material theme installed. This means it should work as well as the current Google Keyboard and should be stable enough for every day use. For those who are a bit paranoid about what changes the authors needed to make to create the standalone app they have posted a diff log comparing the app with the one pulled from the official factory images: http://pastebin.com/MVNGGM47. 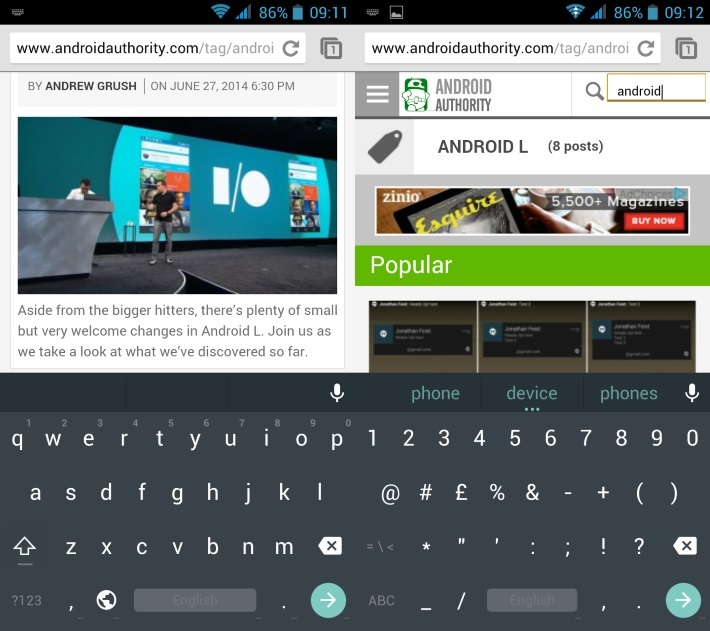 The Android L Keyboard is compatible with devices running Android 4.0 or greater. Personally, I tested it on Android 4.2.2 and it worked without any problems.